This thoughtfully designed portable grill is a hit at picnics, beach trips, and outdoor parties alike. Get that full-bodied smoky flavor without the big production—this small portable grill is ready for summer corn on beach, tapas in the park, or a spur-of-the-moment BBQ in the backyard. Thoughtfully crafted with porcelain, bamboo, and a stainless steel handle, it's as pretty to look at as it's easy to use and clean—the minimalist design means there’s just a handful of pieces, which neatly stack together and come apart. Kind of like a great kebab. Made in Denmark. 7.5" H x 12" Dia. 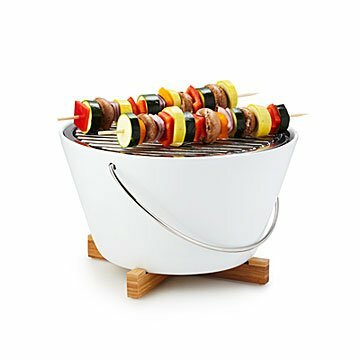 Porcelain bowl, steel insert, and steel grill are dishwasher-safe. The heat shield and trivet cannot be placed in the dishwasher.